When the kids get bored of the beach, there's nothing keeping the entertained with a man putting his head between the jaws of massive crocodile or kissing a deadly venomous King Cobra. Not only for kids, it's certainly entertaining adults too. For such a small island, Samui has it's fair share animal zoos and farms. 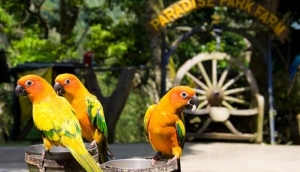 If you'd prefer something a little more easy going than natural predators shows, a day out at the Paradise Park Farm is a great alternative.